This entry was posted in Skip Allen & Painter 12 and tagged Alpha Channels, Brush making, Corel Painter 12, Corel Painter 12 Tutorial Video, Mixer Pad, Painter 12, Painter 12 Real Watercolors, Painter 12 Tutorial, Painter 12 Video, Skip Allen, Skip Allen and Painter 12. Bookmark the permalink. Wow, these are going to keep me going for some time, Skip! Terrific! Thanks for stopping by. Hope you enjoy the videos; I think they are boring, but they were fun to do. Hi Skip. I’m probably missing something. But, I don’t see any videos. Opps, Please disregard. They finally popped in. So sorry! Whew…that had me worried. The videos are large files and would take a minute or two to load. Great fun Skip! Can hardly wait to play! It is fun…I’ll have these brushes out soon and we all can play. Thank you so much for these Skip, they are fantastic. Thanks Claudia…You are always so encouraging and I appreciate it. I am glad you came for a visit. Yes, I’ve had fun Skip ! Just found this and love it ….I will watch it many times. I pick up something new each time I watch one of your videos !! Thanks so much for sharing your super talent with us ! !….and btw : that’s “Another one bites the dust” – Queen.. lol !!! You are too funny !! Thanks for popping by. I was wondering where that song came from…it just sort of popped up…LOL. Glad you enjoyed the videos. Carlos, you always make me laugh. How was the popcorn? Thanks for commenting; I am delighted that you enjoyed the videos. Nice to see you explore making something without a specific “lesson” in mind. Still, there’s lots to see and learn. Funny seeing you use the Clone tool, as we were just speaking about that a day or so ago. Also, nice to see your use of channels and masks. Great series of videos by the way. Thanks for spending the time making these. Thanks for visiting and for the interesting questions. I think the “Real” in the brush category and some brush variant names started prior to Painter 11. I can’t remember if the RealBristle Brushes were in Painter X or not. I do know that the “Real” in several variant names told us that those variants were new to Painter 11. But I think the “Real” indicates that the brush acts very close to the way the “Real” media brush does. Prior to Painter 12 we had Digital Watercolor and Watercolor categories. They are controlled by different brush engines…or codes. Watercolor has many of the same controls that you see in the Real Watercolor, but having the same name doesn’t mean that they work the same. Real Watercolor and Real Wet Oils have their own brush control panels and similar to Artists Oils’, they are divided into sections. For Real Watercolor you have brush, water, pigment, paper, wind and a section for diffusion, which includes animation steps. These sections isolate the controls to work on specific things; we can make the brush wetter with the wetness slider or have it hold more paint with the concentration slider. There is a wetness slider in the Watercolor brush control panel, too, but it seems to have a more global effect. To be honest, I do not know how the two panels work differently, but I know that they do. I get a very different result with Real Watercolor wetness than I do with Watercolor wetness. I know from the experience of working with new Real Watercolor brushes, we can get a much more authentic watercolor look. And using all three of the watercolor categories really does give us an authentic watercolor look. Love the videos, they are so helpful and interesting, and fun to watch. I look forward to seeing lots more, if possible. Thank you Abigail. It is so nice to hear when someone enjoys the videos. I hope to have lots more; I am a bit behind right now…been working on watercolor landscapes and the new brushes. Should be ready soon. My name is John Levins-one of your constant stidents. Unable to play video. No suitable player. What player should I have? Appreciate your help when you get a chance. So good to see you here. Your question is an interesting one. I am not sure I know the answer. I create the videos as MP4 HD videos, which are then changed by wordpress to videos that are MP4 and OGG compatible. I tried to search WordPress for a recommendation of a video player, but couldn’t find one. I would think if you have the latest versions of Window Media Player, Quicktime, and flash you should be good to go. MAC users get Flip for Mac I think, but I’m not a Mac users, so I am not sure about that. First try updating the players I suggested. If that doesn’t work…give me another shout and I’ll do some more research. I was actually working on a landscape last night for hours and the program crashed and I lost all my work. I didn’t save so it was my own fault in that respect. I really like the brushes you are using and would like to find out more about building brushes. Can you offer a source for learning more about it? I’m just starting with Painter 12 and have a lot to learn. I started with Painter 3 and liked the watercolor feature at that time and when I went up to Painter 6 I was much disappointed and stopped working with the program at that time. A lot has changed and I’m excited about what I see now and just very eager to learn everything I can. I love flowers, landscapes and stills I think the best. I hope you’re enjoying your landscape paintings. I forget to save, too. I’m lucky; I have very few crashes. Have you installed the latest patch. If not, do go to Corel’s site and download it. You will be glad that you did. I have a Painter 12 class starting next week at the Digital Art Academy. There is a link to the site in my blog roll. Check it out. I do a video on the new brushes and how to play with the controls. You might enjoy the class. My landscape paintings are driving me nuts…LOL. I am trying to force myself to work on broad areas and not work on any details until the very end. For some reason I find that difficult. It appears I’m current with patches. The one listed is 12.0.0.503 and mine is 12.0.1.727. I’m overwhelmed with how much there is to learn. Right now I’m a little unhappy with the painter color set. Some of the blues are looking aqua and the little dot on the color triangle is outside the triangle a little bit. Don’t know if that’s the problem or not or even how to fix it. I guess I will be spending a lot of time on the learning curve, as it seems. I like your teaching style so I will try my best to follow your blog roll if I can get familiar and figure out where it is. Your videos were most helpful and I was VERY please to find them. There are two things you may need to check for color with Painter. If you go to Canvas > Color Management Settings you can change your color settings. Most folks set their default RGB to Adobe RGB 1998. Try that and see if it helps. Also, it is important that you keep your video card updated. I meant find the address for the Digital Art Academy in the Blogroll, which is just a list of blogs I like. 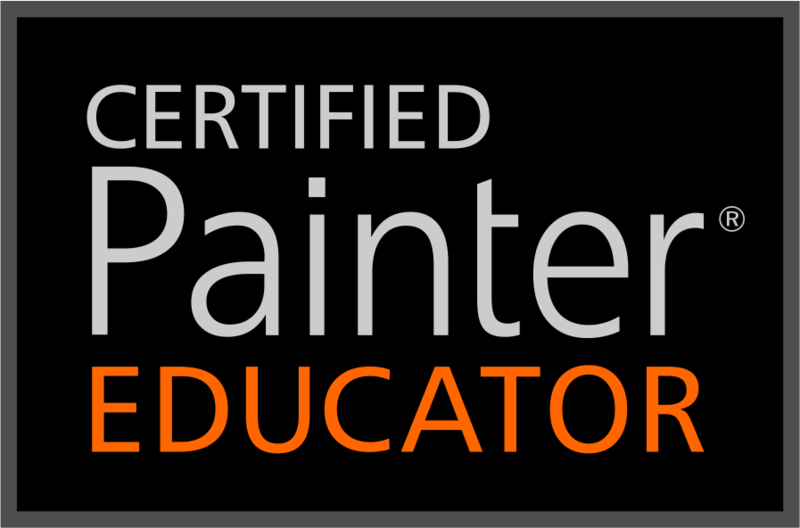 Here is the link for my classes on Painter 12. You may want to check out Elaina Moore-Kelly’s class at LVS, too. I was able to import some other color sets that appear to be giving me the selected colors accurately but there is a lot I need to understand and learn about color. I’m almost wondering if all this is worth it quite honestly as I would hope to be able to print accurately, as well, and sounds like that’s not always straight forward either. I’m wondering if you have a quick answer about a simple problem I have with accidentally knocking one of my paint brush icons “real watercolor” out of the brush selector and how to restore it. No one seems to want to help at the paint factory as my post there in Painter 12 has gone ignored. I shouldn’t be so easy that way to lose an icon. One minute I’m glad and the next minute very disappointed with this program. Thanks for all your help and suggestions. I especially like watching your tutorials. I know you’re busy but if you have any suggestion on this it would be much appreciated. If not it’s okay. I’ll hopefully work out all the kinks soon. Printing can be problematic with any software and printer. The color settings have to be correct on the software and the printer, but most printers will explain what you need to do. I seldom print, but when I did I used a color calibrator to set everything up correctly. You will be fine with Painter 12; just stick with it. You are just feeling the pains of the learning curve. I’m sorry you didn’t get an answer at Painter Factory. Folks may not have undersood the question. I’m not sure I understand how you have removed the Real Watercolor icon, But try this to bring it back: Click on the down arrow on the brush selector. Once the brush library panel opens, then go the options button or fly out menu. In the menu, look for Category Display and click on it and then select Show All Categories. That should bring any missing icons back. I just had an enjoyable time visiting your website and blog. Then I had to go to You Tube and look at your videos. Based on what I saw of your work, I think you are going to love painter. We are neighbors. I live about 40 miles outside of Atlanta in Winston. That is off I 20 W between Douglasville and Villa Rica. We have something else in common…I have bamboo, but I planted mine. My yard is 2 acres and so far, I have kept the bamboo from spreading to the neighbor’s yard. I spend several weeks starting in April keeping it in check. I find that if I see the shoots early, I can just kick them over. I love to paint bamboo. I think I read that you lived in Japan as a child. What a fabulous experience that must have been. I enjoyed the videos. I’m just starting out in painter so you doing a painting from start to finish is a big help. Where did you get the winsor-newton color set? So far I’ve been unsuccessful in finding it. Also, I’m overwelmed with the number and variety of brushes. Just keeping up what the ones I’ve used and getting back to them is a challenge, even with my own palette. I guess practice and experience will make that easier. Karen Bonaker taught me this trick. Keep a small canvas open for testing brushstrokes and brushes. Mine is 500 x 500 pixels x 100 ppi.and I keep it minimized until needed. Then I restore it and try a brush to see if it may be the one I needed. Soon, you will have a favorites brush list. Enjoy and download the color set…be sure to read what I say about it on that page. Just in response, I tried that last night and didn’t work. I was capturing a dab for watercolor and succeeded there. My mouse is a little spastic though I’ve adjusted the settings there. It causes automatic zoom in sometimes which is a little bothersome as well and don’t know if that’s a glitch in the program or my computer. Somehow it knocked the icon out, I think, but not exactly sure how it happened. Anyway, it’s all worth it as I love the program and you’re very right about the painful learning curve but things are moving along fairly well. It seems like just an inconvenience on the icon or just a cosmetic thing given the brushes still work. Hopefully sometime I can learn how to restore it hopefully without having to take it back to factory defaults. Thanks Skip. It’s been nice talking with you. Working on my Corel workspace now. I’ve created a custom one so I can get back to the desktop settings.. I’m curious, (since I haven’t figured out how to do it), how does the panel “Karen’s Watercolors” mix brushes and buttons in the same place? I like having frequently used items located together. So far I haven’t been able to get them to play nice together. Tonight I’m off to my wood shop to do a modification to the sliding tray I built for the intuos 4 I bought. Another question for you is how do you arrange your workspace in reference to the tablet and keyboard? I put the tablet off the desktop so it is below the keyboard. When it is out and usable I find it hard to reach the keyboard should I need to. Wondering how you have the kb, tablet, monitor set so all are usable. Sorry for the delay in the response. You can add commands, brushes, papers, almost anything to a custom panel. If you will look at my post on May 11, there is a video called Painter 12 Custom Palettes. I believe it will show you how to mix items on a custom palette. If it doesn’t let me know and I’ll do a quick video for you. For my keyboard and tablet, I do the reverse of what you do. My keyboard is on a slide out drawer below the surface of my desk. The Intuos 4 is on the desk right below the monitor. Computer is on the desk off to the right. Printer and scanner are off to the left. If my desk wasn’t so messy, I’d take a picture…LOL. I just downloaded the trial version of Painter 12 mainly because of the Real Watercolor brush (I’m mainly a Photoshop person). I tried playing around with it last night and while I think I’m making small progress trying to emulate the results of a watercolor painting, I feel that I still have a long way to go. So I searched around and stumbled upon your blog. The videos seem cool; is there a way for me to download it (especially the HD versions) so I can play it on my Android later? I do not know of a way to download the videos; I don’t think it is possible from the site. My blog is at WordPress and I searched to see if the videos could be downloaded, but couldn’t find any way. Can’t you connect with your Android and play the video? Thanks for the ping back. Excellent article and I agree. Painter 12 does allow you to paint naturally more than any other software I have tried. HI! I’m new in Corel painter and I noticed that the brushes U used are missing in my Painter. I found them really useful so, could U tell me please where can I download them? The brushes I used in this demonstration were brushes that I was developing. At the time I called them Skip’s RWC Raw. Once the set was finished, tweaked and culled, I named it Cool Spring. All of the brushes that I have made and use can be downloaded from my blog. Look to the right and you will see a list of pages. In those pages, look for Cool Spring Download, click on it, and you will have the download link for those variants. The rest of the brushes are in separate pages; all have the name of the set with download in the name. Feel free to download and use any of them. For more brushes, you may want to visit Jitter Brush and Karen Bonaker Art. Both are linked in my blogroll. Thanks! Oh, I forgot to say I really love your tutorials and your clock too!!! I get a lot of comments about the clock; I have started noticing it when I am doing a recording, otherwise I never hear it. Thank You so much for the lesson. I just ordered Painter 12 and love doing floral oil paintings and some water color, this will be alot less of a mess. Let me know when you are doing more florals or anything else for that matter. I found this very informative and at a pace that you can actually learn something worthwhile. I am glad you are enjoying the blog. I know you will enjoy working with Painter 12. Be sure and update it to the newest version, if you didn’t get it with your order. If you subscribe to the blog, you will get an email notification each time I post something. You can subscribe on the right side near the top of the blog. 😦 I got stuck when I tried to paint the flowers (your 4th vid). I don’t know where I’m supposed to get that brush from. I tried downloading brushes from your site, but I’ve really confused myself and don’t know… ohh heeeeelp! Could you maybe direct me as to where I could get that brush from? 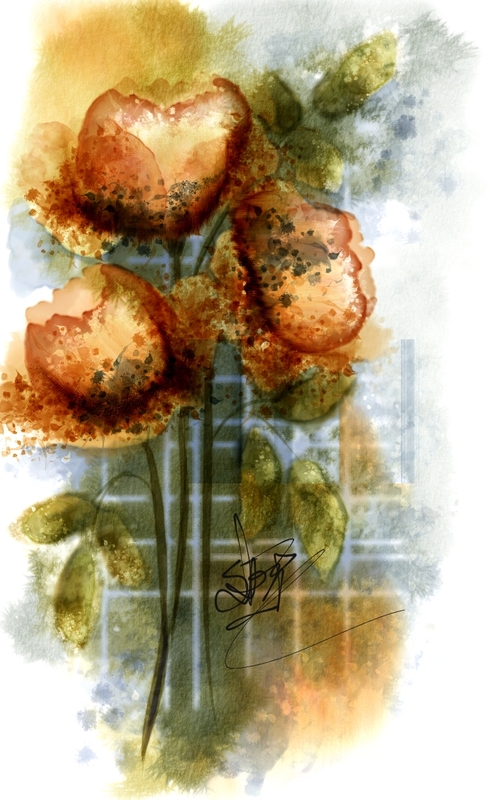 When I was doing the videos for this flower, I was using brushes that were not finalized or ready to distribute. I like to use them in paintings to help decide what brushes to keep and which to cull. Once the set was finished, I named it Cool Spring and you can download them on the Cool Spring Page on my blog…just look to the right at the pages and find Cool Spring Download page. Now once they are downloaded and install, you will still have a problem because I renamed all the variants. You mentioned video 3 and I reviewed it. I used several brushes, so I am not sure which ones you are looking for. I am pretty sure the first brush I use is Cool Spring > Fill 1 or Fill 2…at any rate I’m sure it is one of the fill brushes. The flower parts brush is either in the Cool Spring > Texture brushes or Thick and Thin. Look for a similar dab to what you saw being painted. Loved this video, I am really learning something, watching your brush videos and setting up my palettes for the brushes I like the best. I can you are having a great time in the middle of night(clock chiming). You are helping your students immeasurably and when you have a hitch as we newbies do all the time, you show us how to get out of it. Will save you dumb questions in the future. Thanks for your time and effort. Will be ready for your class! You got me interesting even in painting flowers. Thanks Sandy. I’m so glad you are enjoying the videos. Yep, I make mistakes and I don’t want to edit them out. I think it is important for everyone to understand that blips during painting will happen and it isn’t a big deal. Glad you enjoyed the tutorial and hope you come back often. Thanks for taking the time to comment. I really do appreciate it.